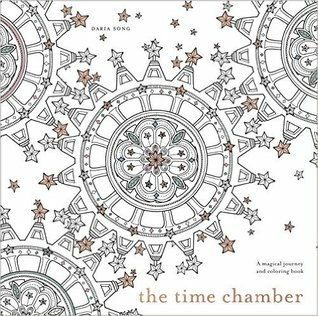 A dazzlingly beautiful coloring book for all ages, this sequel to The Time Garden, 350,000 copies sold, will sweep you away into a whimsical cuckoo clock–inspired world, created in intricate pen and ink by the internationally best-selling Korean artist Daria Song. Then, explore the magical world outside the clock through the eyes of a fairy in the sequel, The Time Chamber: A Magical Story and Coloring Book. This book features the voyage of a red-headed fairy who, when the cuckoo clock chimes midnight, enters the human world. To the tiny fairy, everything seems enormous and magical, from the curtains to the chandelier to a mystical rowboat that takes her further into an inky adventure. With her she packs her favorite items, which colorers can find throughout the book’s pages: an owl-feathered pen, a star-scented spray, a time tape measure...even the key to the time chamber itself. Wow! These coloring books by this author, Daria Song, are just top-notch GORGEOUS! I MUST tell you you HAVE to get the PRINT copy of this book, or else what good is it in the ebook format? It's not! You NEED the physical copy. Enjoy it!!! I decided to take this book and try my hand at coloring in this book with colored watercolor pencils, but I was careful enough to not soak the pages through, yet at the same time, these pages are thick! You don't have to worry barely at all about ruining the next drawing on the next because of the quality of the paper. These pictures to color appealed to me more in this book than in the other book, and I can tell you why. There are a lot more girly-girl pages to color, and I am a true, through and through, girly-girl! Perfume bottle pages, flowers, cute little photos of the fairy peeking through, chandeleirs, and more. To let you in on a secret, if you would like to see the ENTIRE BOOK, yes! ALL the pages in this book you can color, I will have this book’s link down below, click on it, click on “See Inside”, and you can see every single page in this book! I couldn’t believe it when I saw that in the other book! I sure was hoping this book had that same option, and sure enough, it does! You have an enormous choice of what type of medium you want to use to color these drawings with, too! Pencils, paints, watercolors, and more! The paper these drawings are printed on is SO THICK, you have those options to be able to choose from! For a coloring book, this has such a high quality to it, I can’t begin to sing MORE praises for it! I have NEVER seen such a high quality coloring book like these! There is a little story that starts at the beginning and goes all through the book until the end. It’s kind of neat to read because it’s like a little story for us older kids that kind of looks like it might be for kids. Not this time! This time it’s for us! This drawings in this book are entirely clean, as you can see when you look inside of it at Amazon. I think the BEST PART is that this is available to us so WE can color, too! How many of you out there like to color? I do! I was talking about how I used to print off mandellas when I could find them, and I have been having a hard time finding them of late, and now I know why! They are going into coloring books like these! Coloring is SO relaxing! Don’t you remember when you were a kid how quiet, good and into your creative self you felt when you were coloring? How you would look forward to coloring? Here you go! I DO recommend this book extremely high because you are going to be thinking about coloring all day until you get the chance to just sit down and do your therapy! I want to thank the Publisher, Penguin Random House/Watson-Guptill Publications for giving me this book to review for you. I received this book for FREE from the publisher whom I just mentioned, (and if you would EVER like to grace me with such beautiful books again for like this for review, I am MORE than willing to do so for you!!! Being given this book was in exchange for me to read and write a review about this book. It is NOT required for this review to be either positive or negative, but of my own honest opinion. "Free" means I was provided with ZERO MONIES to read this book nor to write this review, but to enjoy the pure pleasure of reading it. I am disclosing this information in accordance with the Federal Trade Commission's 16 CFR, Part 255, http://www.access.gpo.gov/nara/cfr/waisidx_03/16cfr255_03.html Guides Concerning the Use of Endorsements and Testimonials in Advertising.